Throughout June and July, centres across London West offered customers the chance to win holiday vouchers with the first prize being a £1,500 Holiday Voucher! Over 40 centres took part in the competition with our members coming out in full force for their opportunity at the prize. To be in for a chance of winning, members simply referred a friend to their local Better leisure centre. If their friend went on to sign up to a Better Health and Fitness membership between June 1st and July 31st, the member was entered into the draw for the chance to win. The draw for the competition took place 15th August to announce the winners. 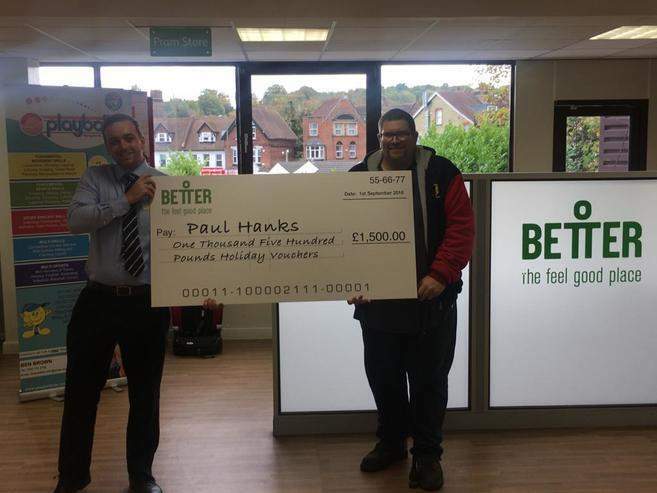 In 1st place, winning the main prize of a £1500 holiday voucher was, Paul Hank from Donyngs Leisure Centre! In 2nd place taking home a £1000 holiday voucher is, Vios Dourous from Swiss Cottage Leisure Centre! Thank you to all customers across the region who took part and we look forward to announcing future customer competitions, to make our customer memberships even better! Make sure you get the chance to be entered into our future competitions by becoming a member now!